This press box may be as close to the ice as any I've been in. Maybe Amsoil in Duluth is closer. Northern Michigan also has benches on opposite sides of the rink a la Michigan Tech and the old Bemidji rink. Brett Knowles is a scratch tonight. Apparently he's sick tonight. Michael Huntebrinker takes his place. Josh Nelson is back in the lineup after missing Saturday. This is MSU's first trip to Marquette. NMU had left the WCHA before Minnesota State joined the league in 1999. MSU goes offsides. Really, really close there. Foguth lays a big hit along the wall. Too many on the ice penalty for Northern Michigan. Palmquist fans on a chance just before the two-man advantage ended. Down to a 5x4 again now. Margonari being helped of the rink by Foughth and Grant after the trainer came out. No pressure on his left leg. come on mavs we need one here. prime time for a goal! MSU penalty coming now. Flanagan for high sticking. That negates all but 39 seconds of the major. Hold the phone. Another MSU penalty. Geravis for tripping. After 2 periods, MSU and NMU are tied 1-1. 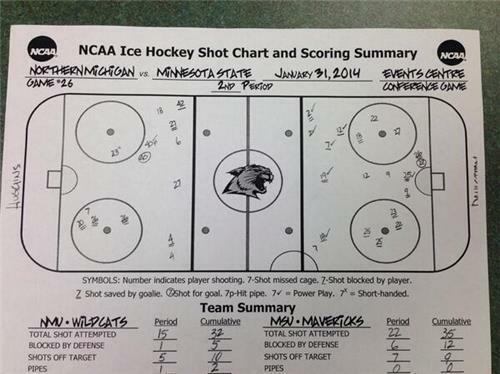 2 MSU penalties during NMU’s major gave Wildcats a 4x3. Goal by Vigier with 16.7s left. So the third period will begin with 1:17 of 4x4 time, followed by 33 seconds of major power-play time for MSU -- barring any more penalties, of course. Hastings is out of the locker room early. Wonder if he'd like to talk to someone. any information on how margonari is doing?